Chain link fencing isn’t exactly the most exciting topic out there, but that doesn’t mean it isn’t an important one. Whether you’re a homeowner or a business owner who needs a fence, chain link fencing could be an ideal solution for you. However, there are a lot of myths about chain link fencing floating around out there that could deter you from buying and installing a chain link fence. Below, we’ll debunk 6 of the most common myths that surround chain link fences to help you make an informed decision about whether or not it’s the right type of fence for you. Chain link fences don’t last very long. The truth is that they’re quite durable and don’t require too much care. Repairing a damaged chain link fence is also pretty affordable, especially when compared with wood or composite fences. Rust is a common problem. Rust can damage chain link fences, but regular cleaning can keep it from happening. Chain link fences are difficult to clean. While this might seem true, pressure washing a chain link fence can make it look practically new again. Some people even paint chain link fences with a sprayer in residential or commercial settings for a more picturesque look. Fences made of chain link are too noisy. Unless you live in a high wind area this shouldn’t be true, but there is a fix. Having heavy wire wound through the fence by the installer can make that noise disappear completely. Damage is common in cold areas. 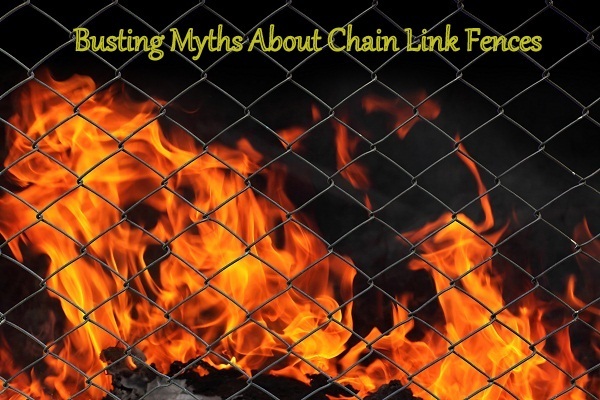 This myth isn’t true, and replacing damaged chain link is much easier than replacing wood. Chain link fences are ugly. While they can be, they don’t have to be. Colors and painted fences are becoming more and more popular, especially in residential settings. Elizabeth is the Owner of California Fence Company, a leading vinyl fence company in Orange County. She is committed to providing the best customer service and high quality installations of vinyl fences for her clients. The company also offers a wide variety of fencing options, including chain link fence installation and hardscape services. This entry was posted in Chain Link Fencing, Fencing Guide and tagged chain link fence, Chain Link Fence Cleaning, Damaged chain link fence. Bookmark the permalink. I am glad that you addressed the myths of chain link fencing, so that we can understand their benefits. That is interesting that chain fences are meant to last a long time. I am glad to know that rust is not actually a common problem. Now that I understand the myths, I am happy to be able to consider the truths in investing in a chain link fence. Thank you for sharing! My wife and I have been debating on what kind of fence we should put in our yard. It seems that we are leaning more towards a chain link fence. I like how you mentioned that they are quite durable and it’s especially nice that they are easy to take care of. We are still in the decision process but we will see. Thanks for sharing. You make a great point about how many people think that rusting is a common problem with chain link fences and commercial properties. It does require a little maintenance to make sure that they stay clean, but maintenance is required for any piece of equipment. Your fence is equipment designed to protect your home or businesses. Keep it clean and it can last you a long time. I didn’t know that there are so many misconceptions regarding chain link fencing. This is the type of fence our neighbors have, so I was planning on matching it so we can fence in our yard as well. It is good to know that they are easy to clean and keep rust-free. I am excited to have a low maintenance yard that our dog can run around in. We have a lot of chain link fence around our farm, and we’ve never had a rusting problem. It probably helps that we live in a really dry climate where it hardly rains. It also get’s pretty cold in the winter and we’ve never had any problems. Thanks for debunking these myths! It would be super easy to just pressure wash a chain link fence. You wouldn’t have to worry about it breaking under the pressure because there are all those holes the pressure can escape from. It wouldn’t get all built up like on a wood fence. Thank you for clarifying that these things about chain link fencing are myths, it will make picking a fence that much easier. I need to get a fence installed in my backyard in the near future. I am trying to figure out what kind of material would be the best option for us. I liked that you discussed these ideas about chain link fences. I like that chain link is relatively inexpensive and durable. I think I am leaning towards chain link. Thanks for the info! Thank you for the help. My wife and I are wanting to get a fence installed around our yard, but I had believed some of these myths about chain link fences. I did think that chain link rusts easily. How often does the fence need to be cleaned to prevent rust? That is good to know that chain link fences last long and are very durable. I want a fence that will last a long time. That is also very nice that they are easy to clean with just a pressure washer. That will make it very easy to clean.